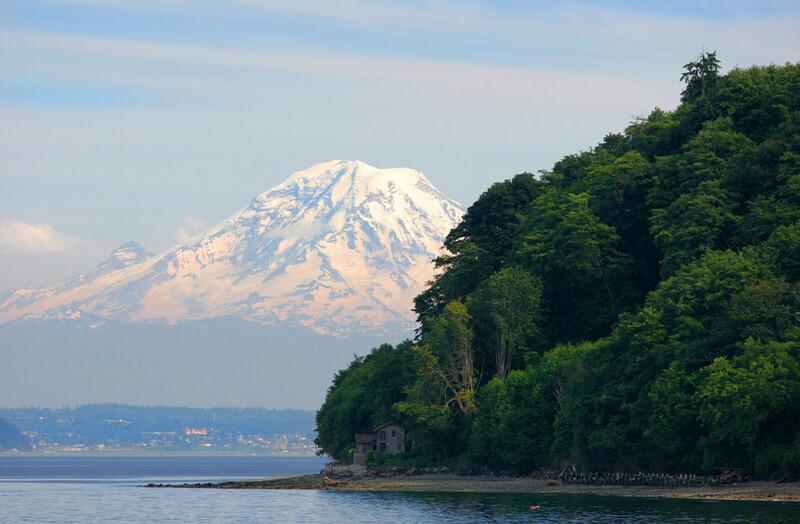 A hulking Mount Rainier dominates the view from the east side of Vashon Island. Portland boasts many mass-transit, bike-friendly destinations, but few locals probably imagine an island getaway is one of them, unless you’re talking Sauvie Island. 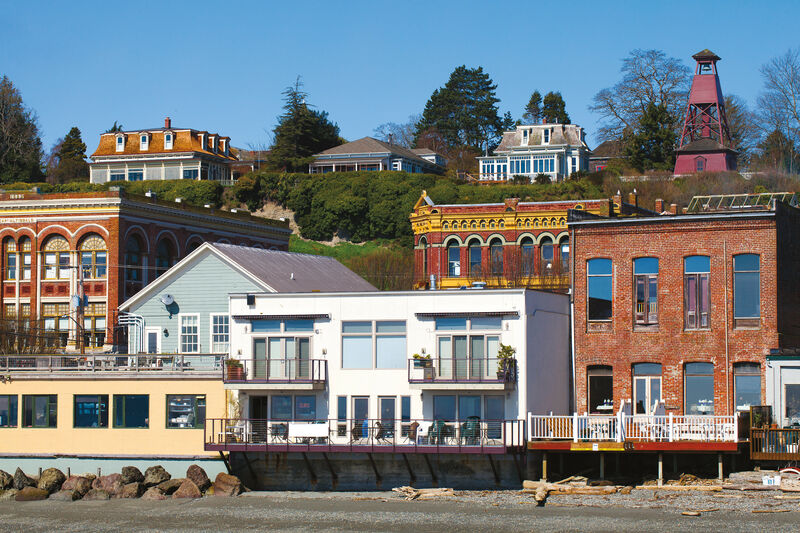 Yet, just link a three-hour train ride and a half-hour float on a ferry together, and you leave the big city behind for Vashon Island, where a nest of art galleries and quaint shops, as well as miles of sandy shoreline perfect for spotting orcas, await. Best of all, there’s a rustic cottage at the Artist’s Studio Loft Bed and Breakfast to call home. When the ferry pulls into the slip at Vashon’s north end barely half an hour after leaving Seattle, the city’s glass-and-steel skyline instantly feels as if it were days away. Vashon, only 12 miles long and 8 miles wide, is home to dozens of organic farms sprawled over rolling fields—and nary a stoplight, let alone bridges to the mainland. Residents zealously guard the island’s bucolic environs: over the years, locals have fought off everything from proposed gravel strip mines to seafood-processing plants. 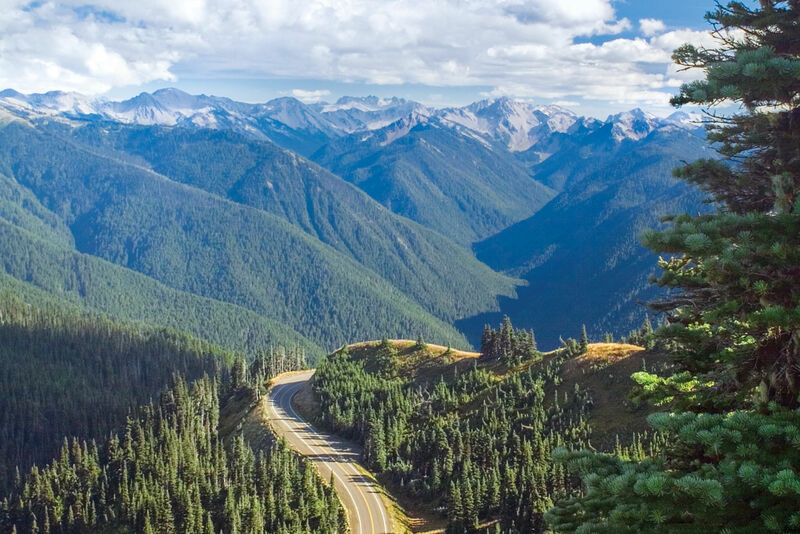 In the early 1990s, some 2,000 of the island’s 9,000 inhabitants famously packed a town hall meeting to oppose a Washington State Transportation Commission plan for a cross-sound link from Seattle. (Some toted signs reading “Bridges Bring Death” and “Don’t Mercerize Vashon Island,” a reference to the sprawl that plagued Mercer Island upon the completion of the Lacey V. Murrow Memorial Bridge, a floating bridge across Lake Washington, in the 1940s.) Thanks to the impassioned display, no bridge has been built. From the landing, it’s a five-mile bicycle ride to Vashon’s town center. Take note, however: the tree-shrouded path heads solidly uphill for at least two miles. If that sounds daunting, a bus from the ferry will take you directly to Vashon. (Two bus routes also service the island for anyone traveling sans bike.) 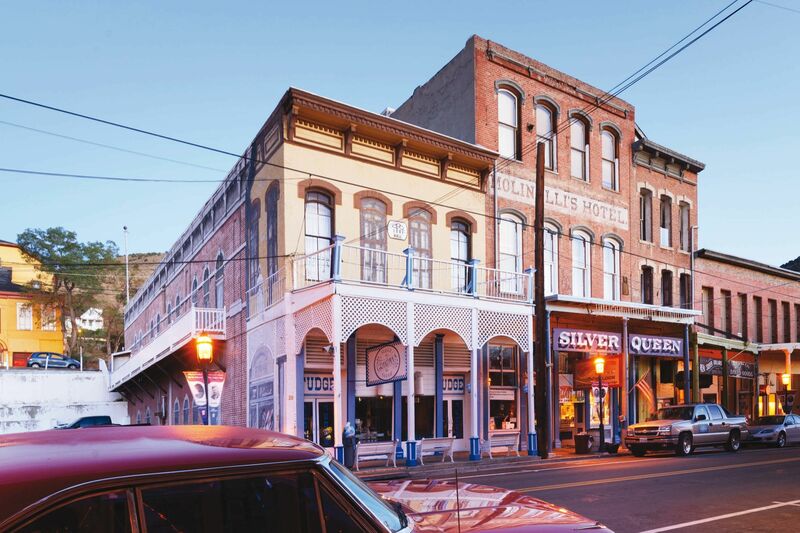 When you arrive in the town—which boasts roughly three blocks’ worth of retail shops, restaurants, and galleries, with a bookstore, a tearoom, and a seasonal farmers market—car traffic picks up noticeably, but moves at a small-town pace. We leaned right at SW Gorsuch Road and carved the final, curvy, mostly downhill mile to the Artist’s Studio Loft, spotting a deer at one turn and waving at the occasional passing car. The bed-and-breakfast’s hand-painted shingle hangs at the edge of a pasture. A bay-colored horse grazed in the neighboring field, flicking its tail and emitting low, sibilant snorts. The innkeeper, Jacqueline Clayton, was on hand to say hello and lead us over stepping-stones—which she had fashioned herself in the shape of rhubarb leaves—toward the meadow behind the main house, where the B&B’s four cottages are set. Clayton, an artist, bought the five acres of what she calls “empty pasture with falling-down chicken coops” in 1983, and then began planting hundreds of trees and building gardens on the land. Rooms and grounds abound with her stained-glass art and mosaics, oil and watercolor paintings, handcrafted barn-wood furniture, and metal ivy gates. In the morning, the inn provided an ample breakfast: muffins, cereal, granola bars, and fresh fruit. But all we could think of was tucking in at the Hardware Store, the place to eat in town. 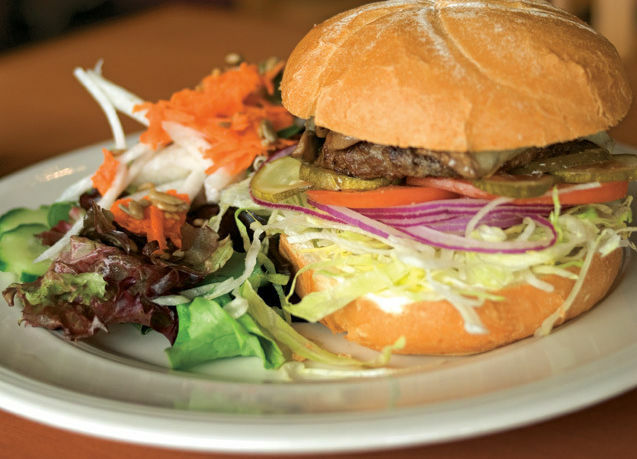 Set in Vashon’s oldest commercial building, a 120-year-old Art Deco–looking structure with a worn wooden floor, the restaurant features exposed brick, a brass-ringed full bar, deep booths, and heavy leather armchairs. 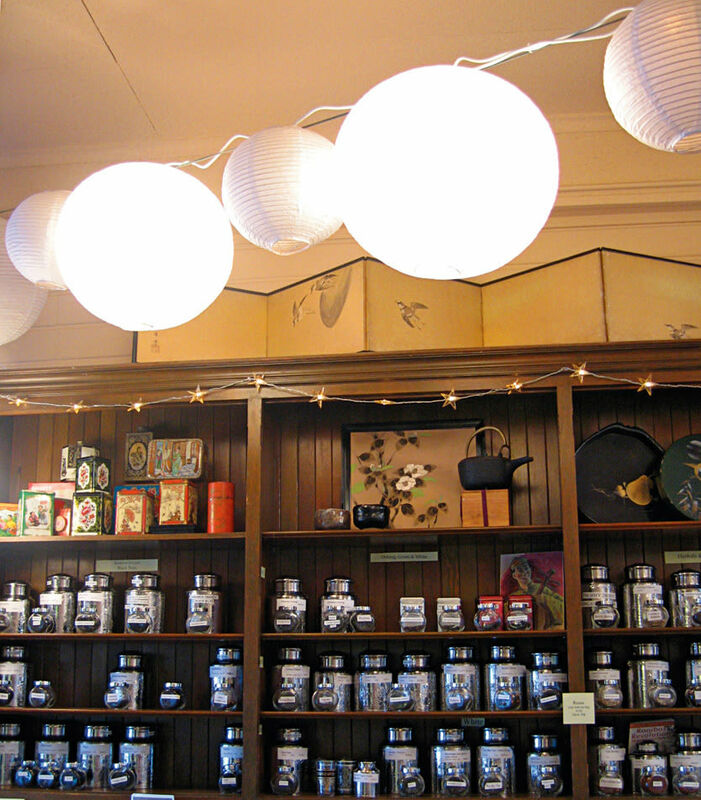 At the back of the room, a coffee bar whistles out Americanos and lattes. 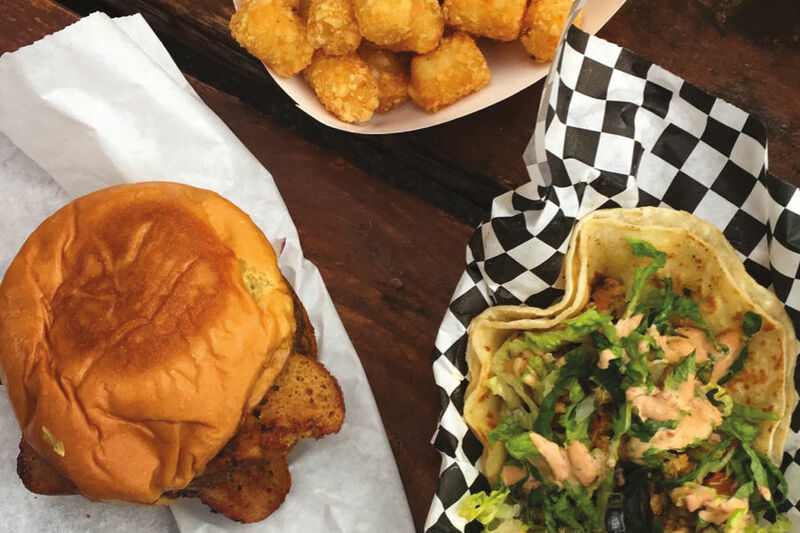 Families, techie business types, day-trippers, and regulars convene for brunches of pancakes, fluffy egg scrambles, and home fries, or tasty fish or portobello sandwiches, satisfying for either lunch or dinner. 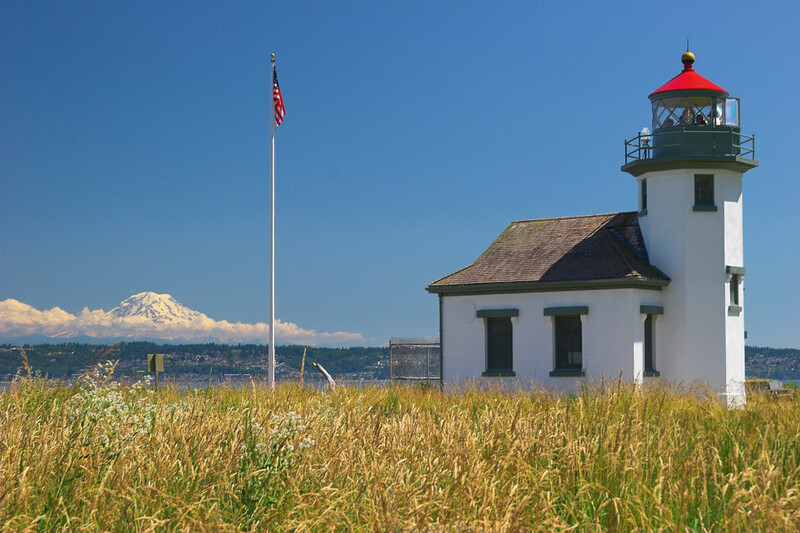 Built in 1915, Point Robinson Lighthouse stands guard over Vashon’s east side. An afternoon tour of the east side of the island includes sights such as the famed Bicycle Eaten by a Tree—a Douglas fir that’s engulfed a rusty bike. Near the hamlet of Burton, the Judd Creek Bridge provides a tree-framed view of Quartermaster Harbor, Maury Island, and Puget Sound; snowy Mount Rainier shines in the background. From here, it’s a short ride to the stately red-roofed Point Robinson Lighthouse, which has guarded the east side of the island since 1915 and still dutifully emits two white flashes from its 38-foot tower every 12 seconds. We’d had enough exertion, so the next day we avoided all nonessential physical activity and slipped into the Vashon Bookshop, where I fished an impeccable used copy of Ken Kesey’s Sailor Song from the shelves, then walked a few steps to the Vashon Tea Shop to lounge and read in a wicker chair the rest of the afternoon. Back at the cottage that night, we set out on a starlit walk. But bright as the stars were, we couldn’t see our hands in front of our faces, let alone navigate a path in the dark. Instead, we sat on the porch in the inky darkness. The car-clogged city felt farther away than ever, our closest companions the unseen crickets and that frog chirping away in the pond.